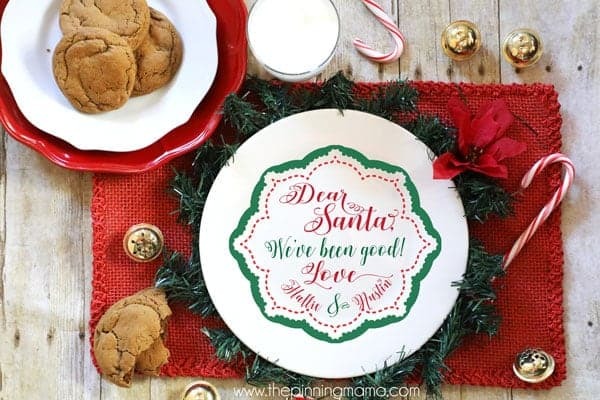 Grab this FREE cut file to make your own personalized Cookies for Santa plate. This is such a fun Christmas craft to make with your Silhouette CAMEO. You can personalize with your kids names to make it extra special! File types included are .svg, .dxf, and .png. If you are like me, than you love two things in life… Crafting and Christmas! My kids get so excited each year to leave cookies out for Santa so we decided to make a special plate they could use each year and they absolutely love the tradition. I made this free cut file that you can grab to make your own too thanks to our partners at The Hungry Jpeg and their awesome commercial use font collections! A blank plate, I bought mine at the Dollar Tree. The free cut file (Grab the FREE cookies for santa cut file here!) – As a special Christmas gift, you can use the file for personal or commercial use! Open the file and personalize as desired. Measure your plate to make sure that the design fits into the dimensions of your plate. Clean the plate with rubbing alcohol to remove any dirt or residue. A- Weed the outer part and transfer the design onto the plate. B- Remove the design and transfer the negative space to make a stencil. Use porcelain markers to complete the design then remove the vinyl and follow instructions on markers to set the design. I hope you like the design and have fun making this simple Christmas project! Let me know if you have other ideas for cut file freebies or projects you would love to see in the future! is the vinyl food safe? Hi Kaitlyn, Vinyl is not food safe. I recommend putting the cookies on a napkin or if you really want to eat off the plate you could seal it with a food grade epoxy.